Parti-gyle is a simple concept: separating the runnings from a single mash to create more than one wort of differing gravities (rather than combining all of the runnings into a single beer). Even though this was originally an English technique (one that some breweries like Fuller's still use) there is no reason not to apply it anytime you are brewing a high gravity beer and have an extra hour or two and an empty fermenter. The first beer will get all of the dense first runnings, so it starts pre-boil at a high gravity and doesn't require an excessively long boil to concentrate the sugars. After the wort for the big beer is collected the mash in infused with sparge water and the wort for a second beer is drained. The gravity of the wort falls precipitously with each infusion, with the second beer usually in the sessionable range and the third down towards "table" strength. The lower gravity beers often take a backseat to the big beer, but there is some room to augment their fermentables. You can cap the mash to add additional color/flavors (for example I made a black IPA from the second runnings from an overclocked Pliny the Elder clone by adding Carafa to the mash after draining the first runnings). You can also cheat, for this second runnings saison I added some malt extract to the boil to help boost the gravity (a flavorful sugar is another option). The initial mash temperature will set the fermentability of all of the wort, this will need to be a compromise (although you might try infusing the sparge water at a temperature that would allow for good beta-amylase activity [~145] with additional base malt in order to increase the fermentability of the second/third beer), the auxiliary beer often come out a bit thinner than you might expect, given the OG/FG, so the extra effort to increase attenuation may not be worth the effort. With the mostly pilsner malt grist of my Calvados Sour Tripel, the best option I could think of for the second runnings was a low gravity saison. The problem was that I wanted to mash hot for the tripel to ensure there were dextrins for the microbes to consume over the long slow souring process, but I like my saisons dry. To try to overcome this conundrum I opted to combine the notoriously temperamental Dupont strain with Brett claussenii for primary fermentation. This is an idea I stole from Bullfrog Brewing, whose Busted Lawnmower is one of my favorite American examples of the style (rustic, dry, hoppy, deceptively drinkable). For the hopping I went with a similar strategy to the one I took with the Hoppy French Saison I brewed last year. This recipe is not quite as hoppy/bitter, but all of that spicy Saaz should complement the peppery phenols created by the yeast strains. I wanted to keep this one free of actual spices to let the fermentation character take the lead. After a few weeks fermenting slowly, with a heating pad to keep it warm, I racked the beer to secondary and pitched the yeast cake into the third in our annual series of spiced dark fruit saisons (this year Alex and I went with fig, buckwheat honey, and anise). 2.00 oz. Czech Saaz (Pellet, 3.50% AA) @ 45 min. 0.50 oz. Czech Saaz (Pellet, 3.50% AA) @ 15 min. 0.50 oz. Czech Saaz (Pellet, 3.50% AA) @ 5 min. 0.50 Tsp Yeast Nutrient Other @ 15 min. Second runnings from Calvados Sour Tripel. Sparged with ~7 gallons of 170 degree water and ran off 7.5 gallons of wort for the saison. Added 1 lb of Light DME to bring the gravity up. Both beers were lower gravity than expected. Chilled to ~85, racked to a better bottle. 3 hours later pitched one tube each White Labs Brett C and White Labs Saison and placed on a heating pad set to low. Ambient temp ~63 F.
Turned off heating pad after one week, krausen gone, but still looks very yeasty/cloudy. 11/11/10 Small pellicle formed. Racked to secondary, gravity still 1.020 (counting on the Brett to get it down below 1.010). Tastes good, nice spicy character, some hop bitterness, still too thick/sweet. Turned the heating pad back on to try to get the yeast moving. 11/18/10 Turned heating pad off, still low 60s ambient. 4/9/11 Kegged with 3.75 oz of cane sugar for natural carbonation. Maybe I'll add dry hops after seeing how it is without. Only made it down to 1.008 (82% AA, 5% ABV), not quite as dry as I was hoping for. 7/13/11 Solid beer, although a bit funkier and a touch sweeter than I had wanted. Next time mash cooler and maybe hold off on the Brett until a few days into fermentation. 7/18/11 Added 40 g of Australian Summer Saaz pellets in a baggie with marbles to the half filled keg to add a bit more fruit and freshness since the Brett is stronger than expected. I've been really into making saisons (both funky and straight up) this past summer and Belgians (also funky and straight up) this fall (including a tripel that's current about 10 days into fermenting). I thought about about this same possibility when brewing the tripel, but will take advantage of it next summer. I used only WLP565 over a handful of generations and liked it, but sometimes wished for more yeast driven characters (I pitched a proper culture at 65-68F, but let it ramp up to 92-95F within the 5-7 days and mostly Saaz hops with different grain bills across batches). What's your preference on saison yeasts as far as strains and fermentation schedules? You might start fermentation warmer with 565, pitch ~80 and ramp up from there. You might also be over-pitching, more yeast growth will add yeast character (although I haven’t played around with under-pitching). For a clean saison I think Wyeast French Saison is the easiest option for making a great beer. It isn't nearly as temperature sensitive as Dupont, its fast, and it always gives a low FG without making the beer taste too thin. I think next time I do a clean saison I’ll mix Dupont and French for the complexity and attenuation. I've tried under pitching with wlp565 and still got more malt vs. yeast character than I wanted, but pitching at ~80F seems to be the solution. I had heard to pitch at usual to high saccharomyces temps and then ramp up, but wlp565 is such a unique creature that the esters created during that first stage of yeast multiplication seems to be what I was missing. Yeah, I've heard wyeast 3711 is a machine, and great combinations of Dupont followed by wyeast 3711 in terms of taste and time. This is a great idea. Still yet to do a Tripel or a parti-gyle. I love me some 3711. Also love me some funky belgians and American Wilds. I need to take the plung into the funk....good thing is, now I probably have enough equipment to have a separate set of equipment for funky beers! What would you recommend for my first sour beer? Berliner Weisse is a good first beer to try going sour with. It needs the least time/effort/moneyis a bit more consistent/predictable because it only requires one more microbe than a regular beer. A Brett’d beer (like this saison) is an easy way to start as well, but it won’t actually be a sour beer. Good luck, let me know if you need any help along the way. I think I should probably read Wild Beers, and then do a Berliner! Cheers! WIld Brews is a great book, but it actually doesn't have that much on Berliners. Brewing with Wheat is the way to go if you want more info on the style. Good luck reading/brewing, let me know how it turns out. I haven't taken an FG yet since I was kegging, but I'd guess it is ~1.004. Brett works pretty slowly, especially considering it sent most of the winter sitting ~58 F in my basement. In 4-5 weeks you'd probably have a sable gravity with just Dupont, but I wouldn't bottle unless it is down really close to 1.000 if there is Brett in it. A drop of .002-.003 is all it takes for "full" carbonation, so you can imagine what that would do on top of priming sugar. Fair point! I'm hoping the 85 degree temps and the 2 yeasts combined can really ratchet it down in gravity in that time. You made me think of something I hadn't considered: if I can get it down to around 1.004, would it be a decent consideration to skip the priming and just bottle it? Relying on Brett to create the "right" amount of carbonation is risky. That is why I tend to let beers age out with Brett until they are stable and then prime as usual. Orval and a few other commercial brewer use can get away with adding Brett at bottling because they have enough experience and control over the process to predict how much their strain will eat in those conditions. So you can give it a try, but use heavy bottles and check them frequently. May I ask two questions on additions of fruit to saisons? 1) I did the petite saison from your book which has turned out amazing thus far. I want to add fruit, so can I rack to secondary in smaller carboys and simply put the fruit in it and leave it at my house temperature (which is California hot; 76-78F) and leave for a few months? 2) I have a saison that is not soured (used Wyeast French Saison (3711)), and same questions. Secondary, add fruit and leave at hotter house temperature for a few weeks and check samples for stability? Thank you so much for your time. Your plan for both batches sounds fine to me. 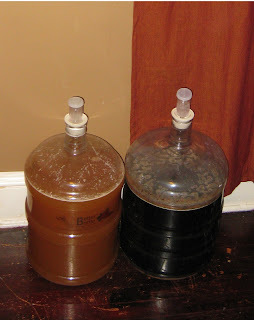 I'd suggest adding the fruit to the empty carboys and then fill with beer (less splashing, correct fill-level). Smart... Will do next time. Again thank you for really quick responses. Did you make a starter or just a vial of each Mike? Given the moderate gravity, I pitched the two tubes directly without a starter.